Karmea triathlon and multisport coaching brings an integrated approach to your training. Working with athletes over all distances and abilities, our coaches balance your training, with nutrition and recovery advice to ensure you reach the start line of your event in your best form, ready to race. Karmea offers, personalised training programmes, training camps, technique specific workshops, and support for all your training needs at our Multisport Hub in Manly, NSW. 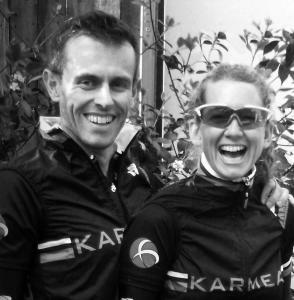 Karmea is run by Performance Coaches Sarah Anne and Warren Evans. Warren is a Triathlon Australia Level 1 coach and Total Immersion Swimming coach. With over 20 years experience in endurance sport, he's competed in triathlon from sprint to Ironman distance, ultramarathons, 24 hour adventure racing, and long distance multi stage mountain bike racing. His experience has seen him race internationally for Great Britain. Sarah Anne is a Triathlon Australia Level 1 coach, AusCycle coach, and a Total Immersion Swimming coach. She is also qualified Master Personal Trainer, graduating as institute champion, and a CHEK holistic lifestyle coach. Sarah Anne has raced triathlon from sprint to Ironman, as well as competitive road cycle racing, ultra marathons, multi stage mountain bike, off road triathlon, she also competed internationally for Great Britain in Duathlon. Success. Coach Karmea Performance has been notified of your message.